We've traced the history of baseball in the BC Interior back to the early 1900s. In the Okanagan the first Okanagan league was formed in 1911 with teams from Enderby, Armstrong, Vernon and Kelowna. Penticton had a team, but was not in the league in 1911, but regularly played games with Oroville across the border. The BC - Washington competitions became a fixture in baseball in this area through the decades. Kamloops the 1911 amateur champions of BC ? That's what it says on the team photo of the Kamloops nine, but our Henry Ropertz (The Rope) had some reservations about the claim and thought he'd better make certain the facts before we posted a photo of the "championship" team. Nestled within the confluence of the north and south branches of the Thompson River and adjacent to the C. P. R. mainline, the community of Kamloops evolved from a fur-trading post in the early nineteenth century to incorporation as a city of 500 inhabitants in 1893. By the time 1911 rolled around, the population had swelled to 3,772 as the economy diversified, immigration intensified and amateur baseball became a growing part of the cultural landscape. Some 220 miles westward, British Columbia’s largest city Vancouver had, according to the 1911 census, doubled in population to 120,847 during a five year span (over 32 times as many residents than Kamloops) and had become the home of a highly-successful professional baseball team, the Vancouver Beavers, champions of the 1911 Northwestern League. The pro game dominated and amateur baseball in the lower mainland, although of excellent quality, received little or no attention in the sporting sections of the competing newspapers. Not much was unearthed in print regarding the regular-season achievements of either the newly-crowned Clovers, winners of the amateur Vancouver City League, who knocked off the defending champion Mainlands in a grueling finish or the leagueless Kamloops amateur squad. The Kamloops Standard printed only one written review of a clash involving their 1911 team, an 11 to 5 victory over the Okanagan College nine in late May. Details were sorely lacking in the rival Kamloops Inland Sentinel which mentioned a June doubleheader sweep in Revelstoke and a split-squad twin triumph in July, at home against Ashcroft and on the road in Salmon Arm. The strength and depth of the group of players was emphasized in the latter snippet which also implied that the team had strung together a “long list” of victories, many or most of which had obviously gone unreported. At any rate, their success against opposition from the interior prompted the Kamloops squad to make a pitch for a series with the lower mainland winners, considered to be la crème de la crème amateurs within the province, with all games to be hosted by the south-central interior community where fan interest in the amateur game would presumably provide greater gate receipts. No evidence was uncovered to suggest that the series was sanctioned by the provincial amateur baseball body as a B. C. senior amateur championship. At the time that it was organized, the series appears to have been considered, by all parties, nothing more than a set of exhibition challenge matches. The huge population imbalance between the rival urban hubs helped foster a vintage “country bumpkins” versus the “city slickers” mentality along the mainline of the interior. The extent of overt gambling on the results, so prevalent in that day and age, can only be speculated. Although nothing concrete was discovered regarding a financial purse for the event, winner take all, such a practice was not an uncommon occurrence in that era. As the Vancouver City League champion Clovers made the trek by train into the south-central interior, they were unaware that the Kamloops team had acquired the services of ace southpaw chucker Ferdy Manning (left) , late of the professional WCBL Calgary Bronchos, to pitch for them in the upcoming best-of-three series. Manning had been in the regular pitching rotation of the Calgary Bronchos throughout the entire 1911 WCBL season (completing the campaign with a 20 – 9 record) and had taken his last turn on the mound on September 2, a win over Edmonton in the final game of the campaign. That date coincides with the rendezvous in which the Clovers captured the Vancouver City League title from the Mainlands. With the WCBL season over, Manning was available as a ringer and the Kamloops team moved quickly in making him an offer, involving incentives, to participate in their forthcoming short challenge series which took place over the weekend of September 23 - 24. It came as no surprise that Manning completely baffled the Vancouver amateurs with his arsenal of offerings as the hosts swept the series in two-straight contests. Reported final scores are conflicting, one mentioning a first game 5 to 0 shutout in which Manning pitched a one-hitter and whiffed seventeen, the other simply mentioning a 4 to 1 Kamloops win. Likewise, one account of the the second-game had Manning again going the route, this time a 7 to 4 conquest of the Vancouverites while the other mentions a 10 to 1 Kamloops verdict. A meaningless third game was reportedly held in which Manning, not known for his batting prowess yet playing at third base, allegedly fulfilled a bonus incentive in his short-term contact by slugging a three-run homer. In any event, Manning‘s popularity in the Thompson River community was such that he could have been elected as mayor of Kamloops. The Calgary Herald even reported that he took a post-series job tending bar at one of the principal hotels to bask in the glory. Meanwhile, the triumphant nine was overhyping their success on the diamond. What began as an merited bragging right for 1911 appears to have ultimately become transformed, in the minds of the winners, into an outright boastful claim of achieving the provincial amateur tiara. Not surprisingly, the Kamloops-staged event was not afforded any coverage whatsoever within the Vancouver print medium nor was any mention of it as being a series with provincial championship implications made within either of the Kamloops publications. Interestingly, however, the Calgary Herald provided some details of the games as the showdown captured the attention of the Herald scribes since the focus spotlighted Broncho hurler Manning who had assumed this new role as a post-season mercenary with Kamloops and had been dominant in doing so. Bottom line.....it is difficult for the Rope to respect the brazen Kamloops claim of outright amateur baseball supremacy. 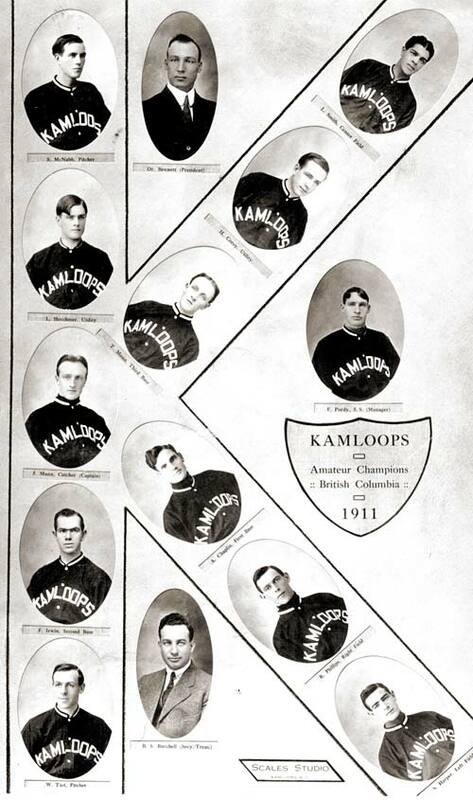 The copy of the 1911 Kamloops team composite, replete with a crest indicating “Amateur Champions . British Columbia 1911” (above) was made available to the Rope by the Kamloops Museum & Archives and does not even include a mug shot of Manning, without whose services as a hired gun, the triumph would have very likely never occurred.